Quarter cracks can be devastating to horse and owner. 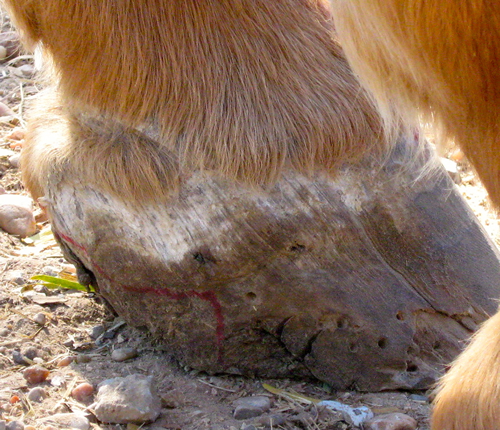 Too much pressure generally causes cracks where the hoof quarters meet ground. As seen below, one remedy is good farrier work and good nutrition using The Perfect Horse®. For best results, Wayne recommends feeding the raw E3Live FOR HORSES for the first 48 days (2 ounces/day) and then switch to the more affordable E3AFA FOR HORSES (460gm) (2Tbl /day). The coupon (Combined15) will give 15% off an order of Live and dry product, when ordered together (Enter Combined15 at checkout). It’s really a no brainer to buy this product for your horse to treat quarter cracks and other hoof issues with our 1 year guarantee that you will see a difference or your money for the products will be refunded. 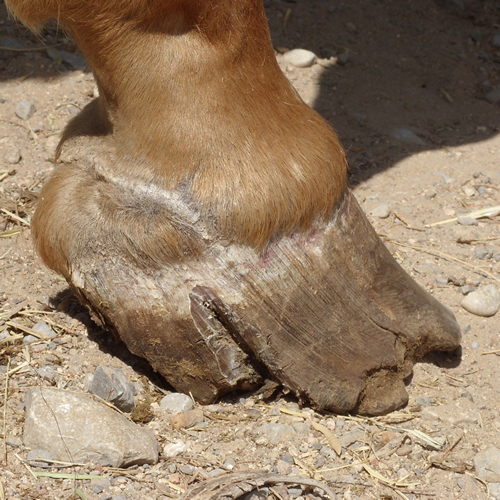 When the owner of this horse gave up on ever repairing, this critically injured hoof, Master Farrier, Ernie Frye, took him in. For the first six weeks Ernie started feeding him The Perfect Horse®. After six weeks of good nutrition, and relieving the pressure to the medial quarter, the hoof had already greatly changed. Just three months later after continuing with The Perfect Horse® the quarter crack had completely repaired. It’s really a no brainer to buy this product for your horse to treat quarter cracks and other hoof issues with our 1 year guarantee that you will see a difference or your money for the products will be refunded. 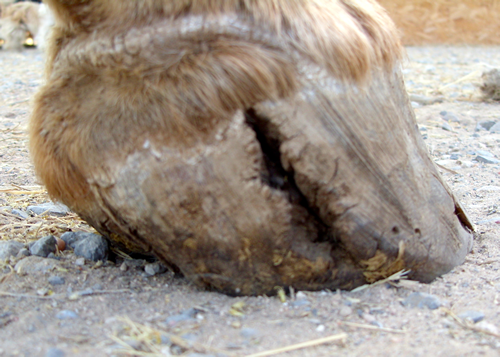 To conquer the effects of quarter cracks in hoofs, it takes good nutrition, good farrier technique, and commitment of the horse owner. Nutrition we can help with. Others formulate mixtures of vitamins that are not absorbable and pass through the animal. When that doesn’t do the job they make a second product that is called extra strength but only passes through more of the unassimilable formulation. AFA is believed to be up to 97% absorbable by the body and is guaranteed to make a difference or your money back.